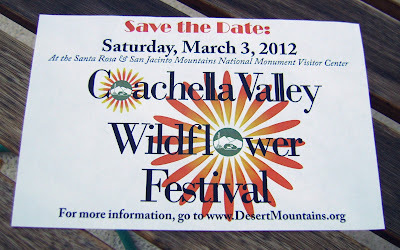 We are making final preparations this week for our participation in the Coachella Valley Wildflower Festival in Palm Desert, on Saturday 3 March 2012. We will have a vendor booth and our hand made Bird Houses, Bee Houses, Bird Feeders and Yard Art will be available for sale there. We had a great time at last year's Wildflower Festival, talking to people about their yards and helping them select items to create a more wildlife-friendly habitat. 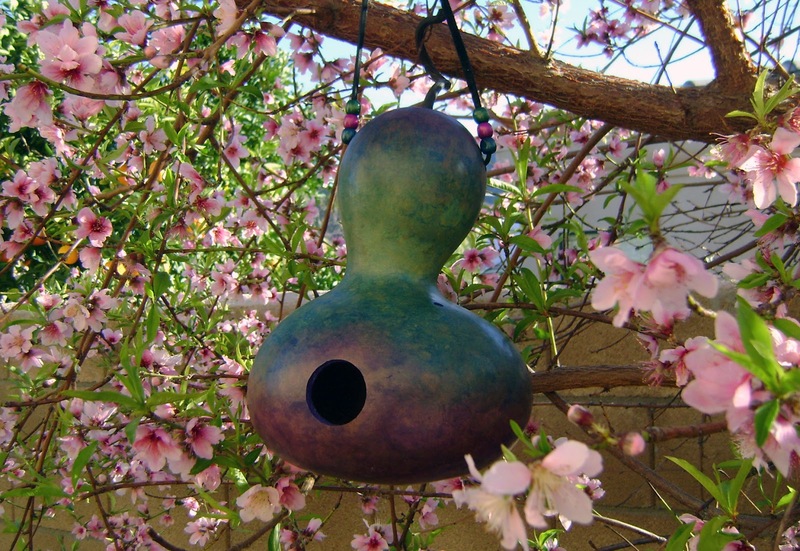 The Bee Houses and Peanut Butter/Suet Feeders were especially popular at the previous event, so we will have a good stock of those available. We will also be offering our new bottle bird feeders for the first time. Please note we will temporarily close our online Esty shop from Thursday 1 March through Sunday 5 March, to avoid the possibility of duplicate sales. Our apricot tree is covered in buds, and a few tentative blossoms have finally emerged. The delicate white flowers have pale pink centers and a soft, sweet scent. 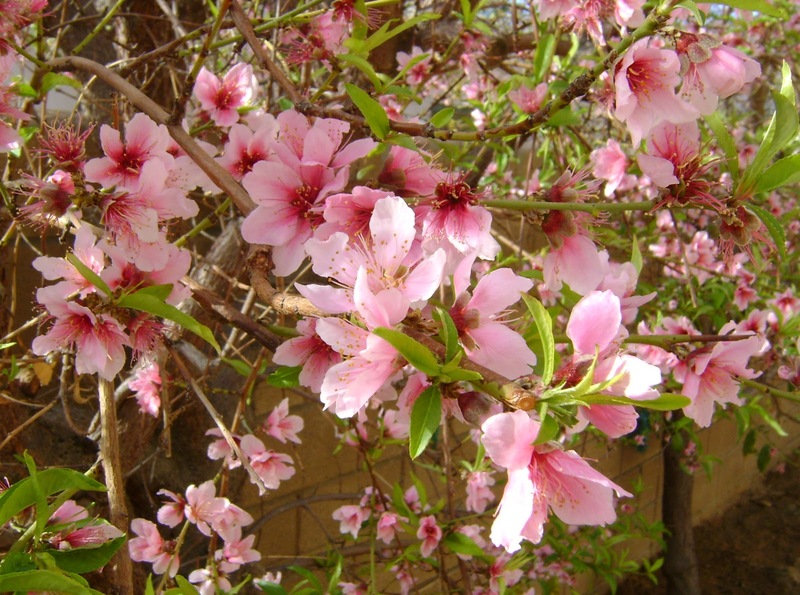 The peach and nectarine trees, which bloomed earlier, are already setting fruit. This flower spike on our aloe is just a few inches high now. 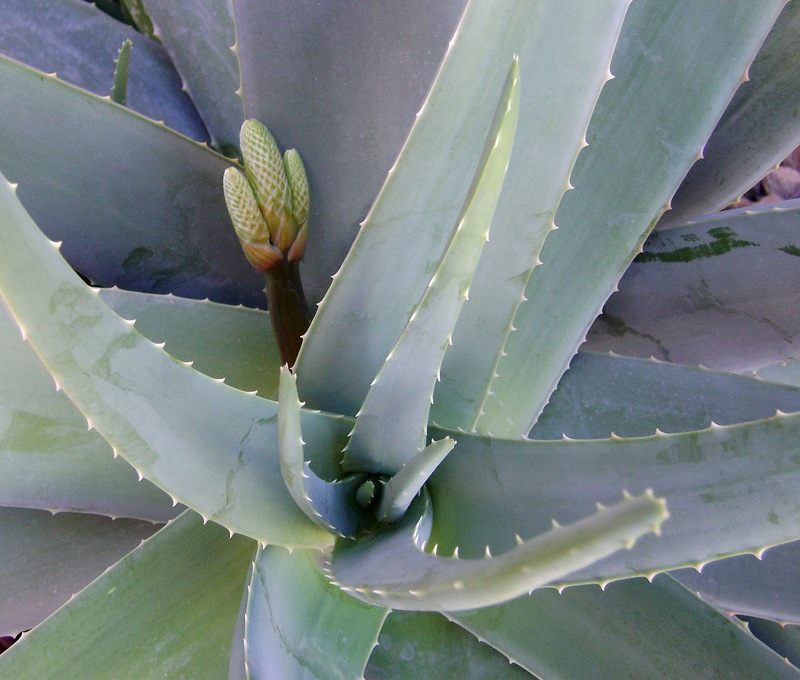 The stalk will grow to about 3 feet tall, with yellow flowers that attract hummingbirds. Weather over the past couple of weeks has ranged from warm days in the 80's, to destructive winds, to rain, to temperatures in the 60's. After enjoying a couple of sunny days in the 80's, we'll be back to low 60's and windy again. "In the Spring I have counted 136 different kinds of weather inside of 24 hours." 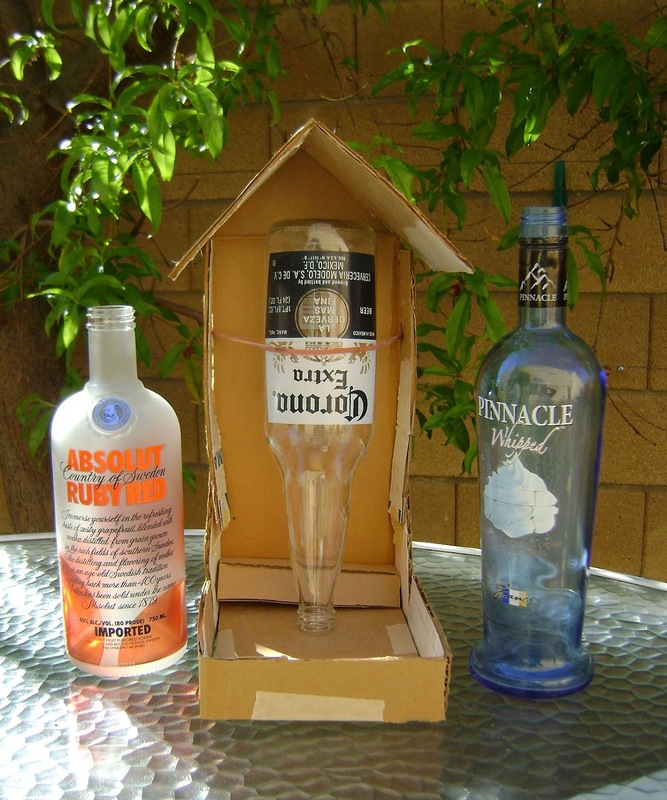 We were clearing the trash off our palm tree lot a couple of weeks ago, and among the items we removed were a couple of cool, (mostly) empty vodka bottles. They had interesting shapes and colors, so we decided to clean them up and turn them into bird feeders. The bottles were rinsed out, washed, then soaked overnight in a bleach solution to get rid of the alcohol smell. After a final rinse, they were put outside to dry thoroughly. Meanwhile, I built a prototype from recycled cardboard, masking tape and a big rubber band. After a consultation between our "design" & "engineering" departments, we were ready to build the first feeder. We are really happy with the results, so we'll be building more to have for sale in our booth at the upcoming Coachella Valley Wildflower Festival, in Palm Desert CA on March 3rd. They will also be available in our online Etsy shop. So a big (air quote) thank you to our litterbug neighbor who enjoys imported flavored vodka. 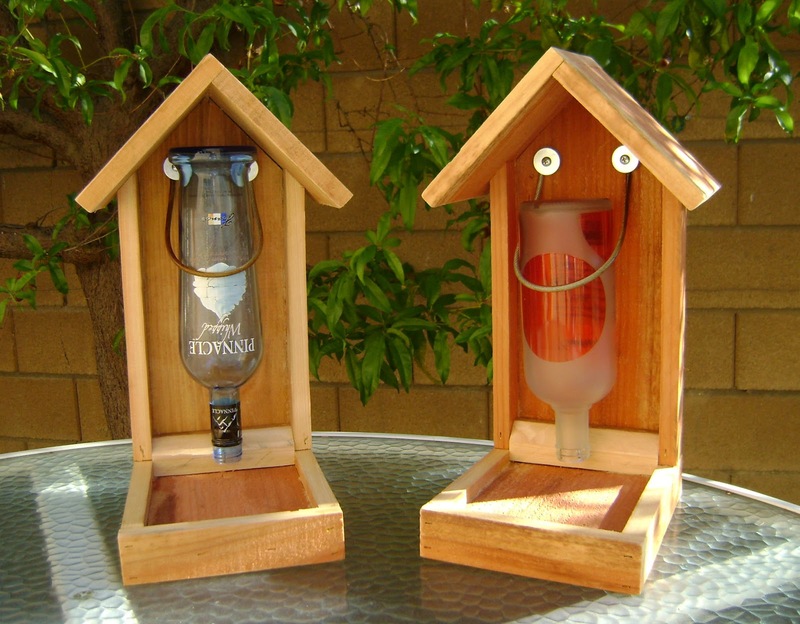 We were able to turn your trash into a nifty treasure for the birds. Our Nectarine Tree bloomed in January. After a couple of days with desert temperatures in the 80's, the dormant branches came alive with a mass of beautiful, lightly scented pink flowers. The bees were kept busy in the profusion of blossoms. Fresh new leaves started appearing not long after the flowers. 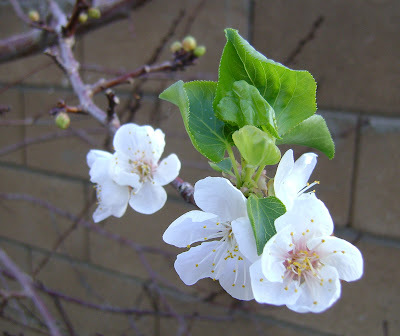 Our Peach Tree bloomed a week later, and the Apricot Tree is still patiently biding its time. I shot new photos of some of the Gourd Bird Houses we have for sale in our online Etsy shop. Once the pics are cropped and re-sized, I'll get them uploaded to our shop. The colors in this image turned out really nice.